January 2016 had 17 homicides reported to or by the Baltimore City Police Department. One was a hit-and-run homicide which can go either way in the final determination, but we’ve kept it in because it’s still under investigation. You can see charts and graphs for these numbers in the charts and graphs page. All data are collected from public sources, news reports, and information released to the public by official agencies. In the 31 days of January, the 17 homicides represent a rate of about 0.55 homicides per day. At this pace, 2016 will end with 200 homicides. However, in previous years, homicides have accelerated in pace when the weather gets warmer. In fact, there was a period of six days without any reported homicides, between January 20 and January 25. Nineteen of January’s 31 days saw no homicides while January 7 saw three and January 29 and 30 each saw two. Tuesdays and Thursdays this month saw the most homicides, with four each. Thursday and Friday saw 3 each. The other days of the week saw one homicide each. As for time of day, three homicides happened between 7pm and 8pm, and 11 of the 17 homicides happened between 4pm and 10pm. There were no homicides reported between 10pm and 6am, something that is seen in the cold weather months. You can always see the map of all 2016 homicides here. There were too few points to really point out a cluster, per se. However, the Eastern Police District had the most homicides, with four. The Northwest and Southeast districts had three each. The Central District had two. The other districts had one each. In terms of neighborhoods, there were 16 neighborhoods with homicides. One, Bolton Hill, had two reported homicides. The others each had one. As in previous years, most homicides were the result of shootings. Ten homicides were by shooting, three by stabbing, two by blunt-force trauma, one by vehicle, and one — the first one of the year — was the result of arson. Thirteen of the 17 reported homicides were men, four were women. 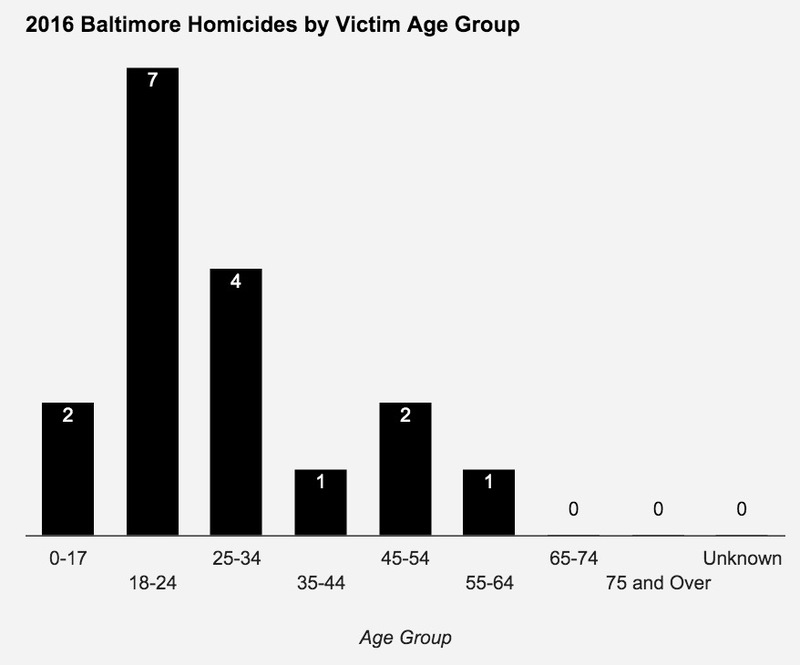 Eleven of the 17 homicides were in the 18 to 35 age groups. Two were children (one age 2 and one age 16). There oldest victim was age 61. She was also the first homicide of the year. The average age of victims was 28. Half of the victims were under the age of 24 (the median age). In terms of race, 11 of the 17 were Black. Two were White. The race/ethnicity of 4 victims is yet to be determined. As is usually the case in cases where the victim is very young, the parent/guardian of the 2 year-old child was charged with their murder. However, this was the exception for homicides in Baltimore so far in 2016. Only 5 of the 17 homicides have been closed or there has been an arrest or identification of the perpetrator. In four of the five closed cases, the victims knew their killer directly or only slightly indirectly (with one or two degrees of separation). One of the 5 closed cases was perpetrated by multiple people — all youths — during a robbery. Finally, using information on life expectancy in Baltimore’s neighborhoods, the location of the homicides, and the per capita Gross Domestic Product of Baltimore, we calculated 721 Years of Potential Life Lost (YPLL) translating to about $17 million in productivity lost. However, this was a very quick and somewhat arbitrary calculation as victim specifics are not very well known.